After a disappointing (to me at least) Sapporo event, the second half of the New Beginning shows is upon us. This one has a stronger card on paper and Osaka is always a hot crowd, which should only help things. 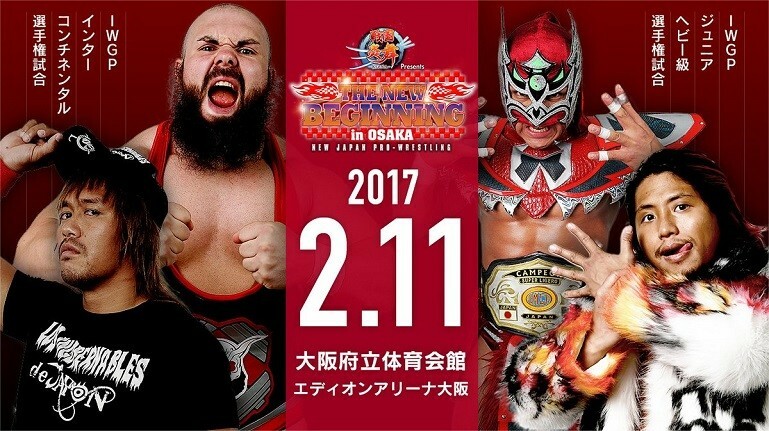 The Osaka New Beginning shows have produced some classics in recent years (Naito/Ishii in 2014 and Ishii/Shibata in 2016 come to mind). After the match, YOSHITATSU refused to shake hands and brawled with Kojima. I’m assume he returns from CMLL as a heel, hopefully one who performs better in the ring and drops the Triple H cosplay nonsense. Post-match, Ryusuke Taguchi entered the ring to congratulate Hiromu Takahashi. Takahashi didn’t care and tried to attack but ended up in the ankle lock. Taguchi/Takahashi is a good idea for the next defense. You hold off on the KUSHIDA rematch, Taguchi is popular and as he showed in the BOSJ finals last year, he can deliver if called upon. It would also work as a bit of a cool down for Takahashi who worked some wild matches since returning. They ran an awesome video package where Michael Elgin spoke about dreaming of competing in Japan. Overall: 8/10. It should come as no surprise that the show centered more around Los Ingobernables is far better than the one last week. The first half of the show is nothing special but nothing there is bad. It mostly features relatively fun tag matches that helped build future matches. Once we got to the NEVER Tag Title match, things picked up. That was a fun match and the IWGP Tag Titles were decent. Shibata/Ospreay was out of this world and somehow the third best match on the card. Lee/Takahashi was one of the best Jr. Title matches I’ve ever seen and a step up from their already insane matches. Same goes for Naito/Elgin. They bested their past and put on an incredible main event.